This week our Collections Development Officer Michelle Kaye reveals what’s been happening as part of the A&C’s fire recovery project. 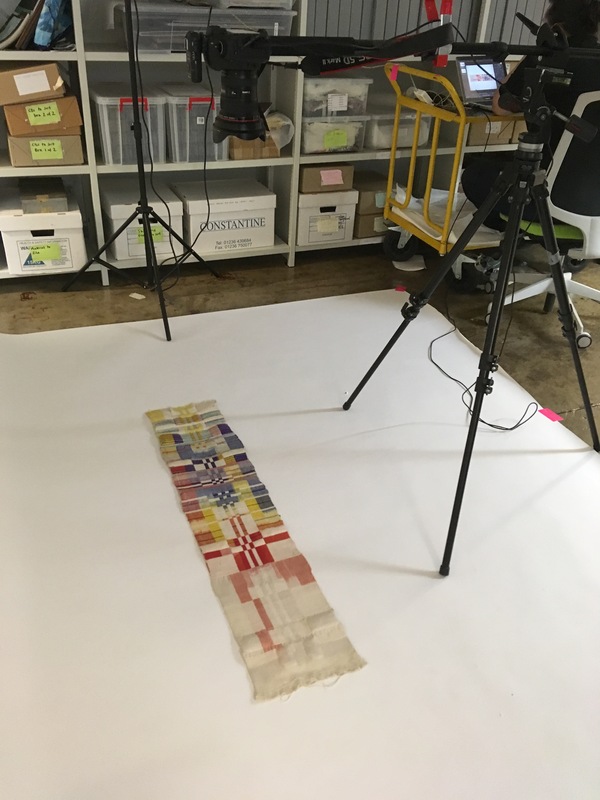 I’m really excited to share with you some details about two projects currently going on in the Archives and Collections. The first relates to the digitisation element of our Archives and Collections fire recovery project. Learning at first hand how important digitisation can be for preservation reasons, in terms of providing virtual access while physical access is not possible, and for generating surrogates as a record of what has been lost or severely damaged, means that, as part of our fire recovery project, we have developed ambitious plans to digitise significant parts of the collection. In fact, we are going to be capturing around 60,000 frames in total! This includes our art, design and architecture collection (NMC) in its entirety, which comprises a wide variety of material, ranging from sketchbooks, prints and architectural drawings to watercolours, ceramics, sculpture and metalwork. We’re also digitising all the textiles in the collection. There are two strands to the digitisation: 2D material will be digitised by an external digitisation company, this work will be starting early next year. 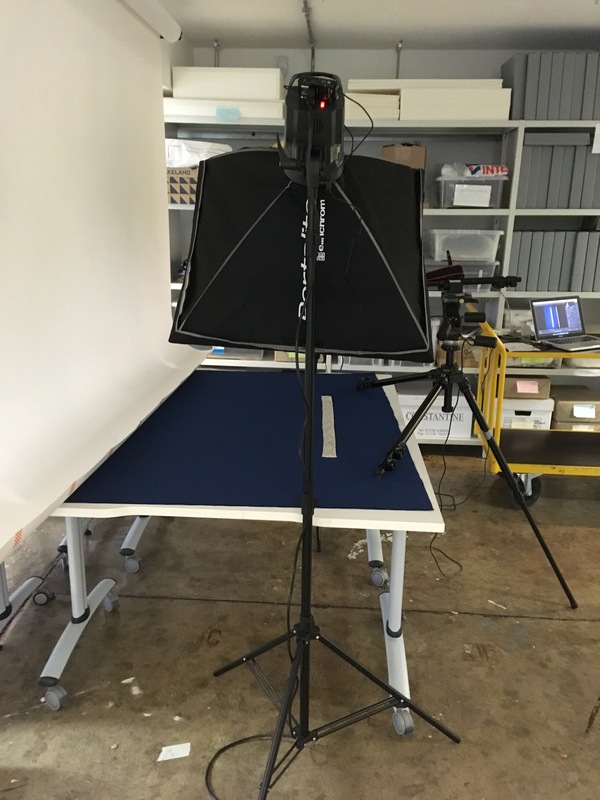 Meanwhile, 3D material (objects and textiles) is being photographed in-house by freelance photographer Patrick Jameson, with the assistance of the A&C’s Documentation Assistant Lucy Stock, and Support Assistants Matilda Heydon and Rowan Campbell. We are also in the midst of migrating to new collections management software and so, over time, we will be adding all of this newly digitised material to our online catalogue. We will be releasing these new images in batches following the launch of the new catalogue towards the end of 2019. As with our current online catalogue, low resolution versions of the images will be available to download free of charge for personal and academic use, via a Creative Commons license. Watch this space for details of when more material will be accessible online! The second exciting update I have for you relates to repackaging our textile collection. 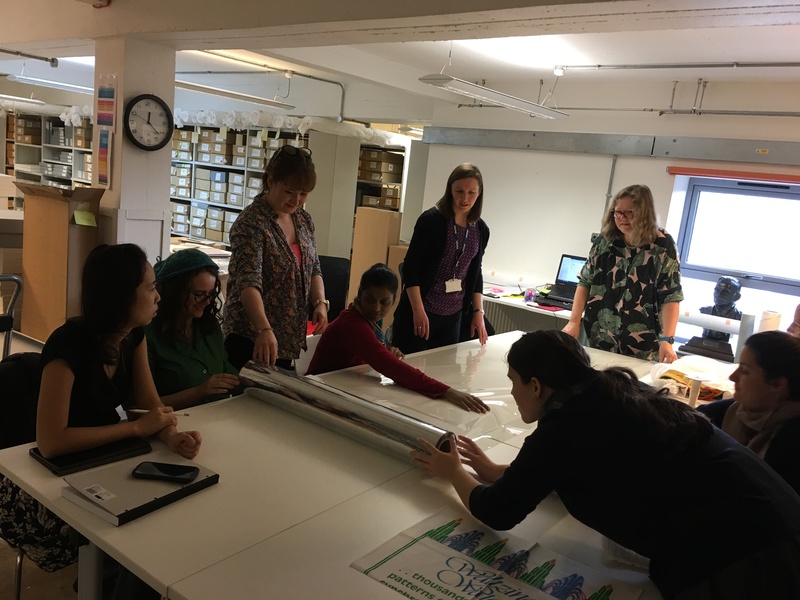 Six lovely first and second year students from The University of Glasgow’s postgraduate Textile Conservation course have been volunteering with us on a project to roll larger textiles from the collection on to conservation-grade cardboard tubes. 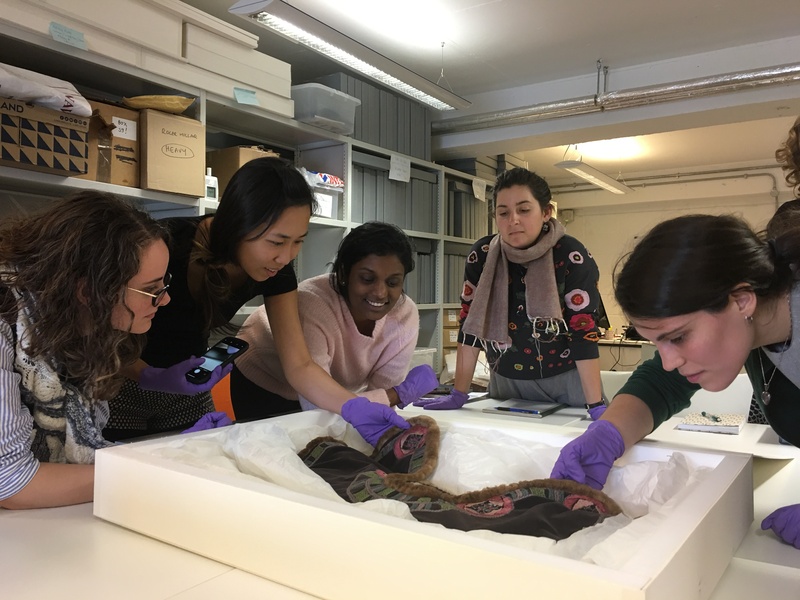 Before signing up, the students visited us in September to hear about our textile collections and about our complex textile repackaging project from Recovery Project Lead Polly Christie. 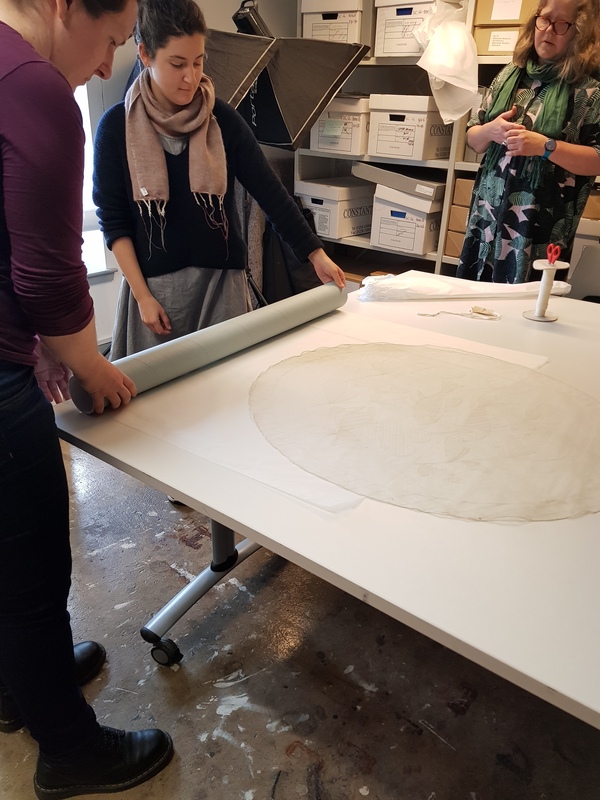 Back at the beginning of October, A&C staff and volunteers were visited by Tuula Pardoe, Textile Conservator at the Scottish Conservation Studio, who provided a training session about rolling textiles, so we were fully equipped to deal with the task ahead. We are now nearing the end of this aspect of the textile repackaging project and are very grateful indeed to Anaka, Caterina, Viviane, Isabella, Kayla and Andrea for their work on this, and to Sarah Foskett and Karen Thompson, their tutors at The University of Glasgow for helping us set up these volunteer placements. More posts to follow from Lucy Stock and Jennifer Lightbody on the ins and outs of these two exciting projects – watch this space!